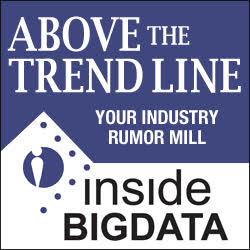 Above the Trend Line: your industry rumor central is a recurring feature of insideBIGDATA. In this column, we present a variety of short time-critical news items grouped by category such as M&A activity, people movements, funding news, financial results, industry alignments, customer wins, rumors and general scuttlebutt floating around the big data, data science and machine learning industries including behind-the-scenes anecdotes and curious buzz. Our intent is to provide you a one-stop source of late-breaking news to help you keep abreast of this fast-paced ecosystem. We’re working hard on your behalf with our extensive vendor network to give you all the latest happenings. Heard of something yourself? Tell us! Just e-mail me at: daniel@insidebigdata.com. Be sure to Tweet Above the Trend Line articles using the hashtag: #abovethetrendline. 2019 is the Year-of-AI and insideBIGDATA will lead you to the promised land with respect to learning how to derive competitive advantage from this exciting technology! Let’s start with some new funding news … CrediFi, a leading source for data and analytics for commercial real estate finance, announced it has raised an additional $6 million in funding. This comes on the heels of the $13 million previously raised in Series B funding. The investment will be used to expand the firm’s go-to-market efforts, as well as the recruitment of executive and team talent in New York and Israel. The round was led by Liberty Technology Venture Capital II, joined by investors Mitsui Fudosan, one of Japan’s leading real estate investors, and Maverick Ventures Israel. Existing investors in the company, including Battery Ventures, Viola Ventures and crowdfunding site OurCrowd, also invested in the current financing round. The Company has raised $29 million overall, including the current round … Varada, the pioneer of big data inline indexing, announced a $7.5 million seed funding round led by Lightspeed Venture Partners, with participation by StageOne Ventures and F2 Capital. The round was secured in two phases, with $2.5 million of investment initially led by StageOne Ventures and F2 Capital last year and the completion of the round led by Lightspeed Venture Partners, including existing investors, to expand business operations and development. Enterprises are seeing exponential growth in the amount of data generated daily and in the business opportunities that data can enable, however most of the value of data is untapped, due to the heavy investment that is required for data infrastructure, data preparation and simplifying data access. Additionally, the architecture of most data infrastructures is rooted in outdated hardware where the main storage media is spinning drives, the network bandwidth is limited and the I/O latency is high, creating many limitations that necessitate data preparation. In M&A news, we heard … Guavus, a Thales company and pioneer in Artificial Intelligence (AI)-based analytics, announced that it has acquired SQLstream, a real-time streaming analytics company based in San Francisco, CA. The acquisition enables Guavus to expand its offering, providing communications service providers (CSPs) and Industrial Internet of Things (IIoT) customers access – at the network edge – to real-time, cloud-enabled streaming analytics to address their growing big data needs … DataDirect Networks (DDN®), a leader in at-scale storage solutions, announced that its successful acquisition of Tintri® was selected as the Information Technology Deal of the Year in The M&A Advisor’s prestigious 13th Annual Turnaround Awards. The Annual M&A Advisor Turnaround Awards recognize the leading distressed M&A transactions, restructuring, refinancing, products and services, firms, and professionals in the United States and international markets. Nominations represented more than 275 participating companies and were judged by an independent jury of industry experts. The awards will be presented to the winners at a gala reception on March 28, 2019, at The Colony Hotel in Palm Beach, Florida. DDN acquired Tintri in the summer of 2018 to expand its footprint in enterprise IT, gaining the industry’s leading data insight, automation and virtualized environment management solutions. The newly created Tintri by DDN division has heavily invested in rebuilding an expanded worldwide service and support infrastructure, and staffing engineering and customer-facing functions. These efforts have greatly improved customer satisfaction and have delivered revenue growth that exceeded expectations in its first full quarter of operation. In the new partnerships, alignments and collaborations department we learned … Leading global technology solutions provider Saggezza announced a partnership with cloud data warehouse technology provider Snowflake, which will benefit Saggezza’s clients by reducing costs for data-related projects and expanding ways in which the data can be interpreted. This partnership further strengthens Saggezza’s commitment to providing a full set of the most modern technical solutions for its clients. The expanded capabilities of the partnership bring several specific benefits for data-related projects. With Snowflake, Saggezza can aggregate all sources of client data into a single source for easy viewability, providing a 360-degree view of data and making it easier to attain actionable insights from the data. The solution also provides a unique architecture that keeps data storage separate from the computational component. This reduces costs-per-second expenses, and makes it possible to create multiple data clusters that let analysts run as many queries as needed, whenever needed … A1 Digital, a subsidiary of the A1 Telekom Austria Group, and BigML, a leading Machine Learning platform company based in USA and Spain, have agreed on a strategic partnership for joint Machine Learning solutions. With the partnership with BigML, A1 Digital aims to accelerate its growth in the Machine Learning market in Europe and beyond through fast-paced Machine Learning innovation and synergies with its European cloud solution Exoscale that will allow A1 Digital’s customers to benefit from a purely European alternative when it comes to Machine Learning platforms. Machine Learning driven applications allow companies of all sizes to extract value out of its data: e.g., to increase revenues, to reduce costs and risks, or improve customer satisfaction or security. BigML’s Machine Learning platform already helps hundreds of organizations worldwide to prepare their data for Machine Learning and to build, evaluate, and deploy predictive models, the essential part of every Machine Learning application, in fully automated fashion … C3, a leading enterprise AI software provider for accelerating digital transformation, announced that Enel, Europe’s largest power utility for market capitalization and number of customers and a pioneer in smart grid technology, is working with C3 as its strategic provider of big data platforms and applications across its business. Following a successful five-year collaboration, C3 is providing Enel with the C3 AI Suite, a range of AI and smart grid analytics applications that allowed Enel to deploy in December the Enel Unified Virtual Data Lake, integrating data across its Retail, Distribution, Trading, Renewables and Conventional Generation businesses. The C3 AI Suite integrates, aggregates, and makes available unified data across ERP, HR, financial, and operational systems, including SAP Hana, Oracle, Siemens, PostGreSQL, MongoDB, and Cloudera, to enable and deliver next-generation AI applications across Enel’s business. In the new customer wins category we heard … Revulytics, Inc., a leading provider of software usage analytics for on-premise software, announced that TechSmith Corporation, a software company developing screen capture, screencasting and video editing software, has chosen Revulytics® Usage Intelligence to help its customers get more value from its Snagit and Camtasia software. TechSmith helps millions of users create high-impact videos and images, in fields ranging from marketing and training to higher education. The company needed a more effective way to drive trial conversions, upgrades, site license renewals, and cross-sales – but lacked the customer data to do so. Helping users get more value from their software is a goal shared by TechSmith’s product teams, product marketers, content management specialists and developers. Understanding how customers actually work with their products is central to their success … DriveScale, a leader in delivering Composable Infrastructure for data-intensive workloads and a 2018 Cool Vendor by Gartner for Cloud Infrastructure, announced a major customer deployment in China – SF Express. As one of the largest shipping companies in China, SF Express was challenged with trying to solve the inefficiencies and underutilization of resources in its data-intensive computing deployments. DriveScale is enabling SF Express to expand its data center and grow its operations. We also learned of newly formed Pacific Data Science, a data science consultancy, that enables companies of any size to realize the full benefits of cutting-edge analytics and machine learning. Formed by industry veterans from aerospace, finance, government, and healthcare, this US-based consulting group helps their clients set up enterprise-grade data pipelines to solve complex automation, segmentation, prediction, scheduling, and resource allocation challenges. Pacific Data Science helps clients get the most value out of their data. Pacific Data Science leverages industry-leading practices and technologies to solve tough challenges, and works with SQL, Python, BigQuery, TensorFlow, Hadoop, Spark, and more. Trust and privacy are the cornerstones of security. Security does not necessarily imply obscurity and withholding – a society just won’t work in such a world. For society to work, physical entities need to trust each other and ensure privacy. You can’t go to a doctor and not tell the doctor about what is bothering you because you fear the doctor will not respect your privacy. You trust the doctor. Now phase shift to today, where a doctor is using a digital assistant to capture notes, and you are using web and mobile interfaces to interact with the doctor. Now there are digital representations of physical entities in play (digital assistants, web and mobile apps) that need to afford the same (if not higher) levels of trust and privacy to you and the doctor. Systems will need to change soon to accommodate this status change of digital entities. Digital entities will become at-par with physical entities, and as such, the social contracts as we know them will need to change to ensure the trust and privacy boundaries across humans, systems and data are upheld,” said Setu Kulkarni, VP, corporate strategy at WhiteHat Security. Data Privacy Day serves as a reminder to remain proactive in protecting and managing your data. The only way to ensure that your business and customers are protected, and remain compliant with any regulations is to know where each piece of data sits and who can access it, as well as tag it and track its lineage in order to understand its usage. In addition, to further data protection and comply with subject access requests, data must be stored in a location with fast and adaptable extract capabilities. This is particularly challenging for organizations with a large number of data sets, where manually processing all of this information effectively can be time intensive, and error-prone. This is where automation comes in – data infrastructure automation can help companies ensure all data is adequately tagged, ensuring data is identifiable, auditable and quickly retrievable. This can help companies prove their level of data privacy compliance to regulators and customers,” said Neil Barton, CTO, WhereScape. Data privacy was a hot topic in 2018, and that trend is expected to continue in the coming months. Over the next year, I believe we will see the first sign of government control over large internet service companies. Organizations such as Google and Facebook still don’t seem to understand what privacy means. I think we will actually see some form of legislative control being put forward or even break-ups considered,” said Stephen Gailey, solutions architect at Exabeam. All businesses know by now that they need to prioritize data protection – there’s certainly enough headline scare stories of data leaks, outages and ransomware attacks that should have persuaded them over the past year. Adding to this is the modern consumer perspective of ‘there’s no excuse for downtime, or the loss of data’. Businesses need to be focusing on ensuring they are resilient against the many threats facing data today, to prove to their customers they are taking data protection seriously. The adoption of the latest technology, with innovative new approaches, has led to this number of both planned and unplanned disruptions in a business rising. Combating this means companies need to start looking outside of traditional backup capabilities to keep the business online; they need to choose a modern, resilience approach that can utilize continuous data protection. This, paired with the ability to orchestrate and automate the mobility of applications to the ideal infrastructure, will enable businesses to have more than just their customers’ data protected. Organizations will become completely IT resilient, protecting data, infrastructure and reputation – without the downtime,” said Steve Blow, tech evangelist at Zerto. Cyberattacks regularly made headline news in 2018, and no organization wants to be at the center of one. Data Privacy Day serves as an important reminder for every organization to perform an assessment of their own vulnerabilities. Organizations need to understand how much data they need to maintain, the sensitivity level of the data and where the sensitive data is stored. A backup from three years ago will do no good if an organization is targeted by cyberattackers, and that’s why a backup schedule that ensures data is available from a period far enough back to restore prior to the issue is necessary. No one can predict when a disaster – natural or man-made – will occur, so having a restoration plan that is documented, tested and understood by all employees involved will keep organizations safe no matter what happens,” said Trevor Bidle, vice president, information security and compliance officer at US Signal. People mostly think of data privacy from a perspective of content that is already digitally accessible, but one of the risks that is not discussed enough is the amount of data that’s exposed and vulnerable because it’s stored on paper or exiled in data sources like backup tapes, optical media, hard drives and even microfilm,” said Alex Fielding, interim CEO at Ripcord. “Data Privacy Day should be a reminder to legal, financial services and other global industries that they must take steps to digitize and extract PII in these less than accessible data sources and automate reporting for compliance with SOX, GDPR, the California Consumer Privacy Act and other regulations,” said Alex Fielding, interim CEO, Ripcord. Data Privacy Day serves as a significant reminder to the technology industry that securing your data is of utmost importance. As more organizations are moving their workloads to edge and hyperconverged environments, companies are looking to protect and recover these workloads. Backup and disaster recovery used to simply be good business practices. Now, for many industries, they are a big part of regulatory compliance. Data is more valuable than ever before and how data is managed and protected is increasingly being regulated by law. Platforms that include a variety of backup and disaster recovery features including snapshots, replication, failover, failback and cloud Disaster Recovery-as-a-Service are key,” said Alan Conboy, CTO, Scale Computing. The notion of data protection might be starting to sound repetitive, but it is still top of the business agenda. IT security threats come in all different shapes and sizes, and just as quickly as we put up barriers, cyber criminals find new ways to break through. Businesses need to have confidence in their recovery strategy; relying alone on the traditional ways of backing up data is not sufficient. Organizations need to ensure everything is protected including the data, finances and the organization’s reputation. Threat detection software is only half the battle, keep in mind ‘what if any attack succeeds?’ and ensure there is a second line of defense in place that can offer a comprehensive range of security features, from encryption through to backup, hardened archiving, and recovery. Alongside product investment, take the time to educate employees on the latest threats, which in turn will build confidence,” said Gary Watson, CTO of StorCentric and founder of Nexsan. As we celebrate the first Data Privacy Day since GDPR went into effect, now is a good time for data privacy advocates to recognize that their efforts have transformed the way the business world protects personal data,” said Patrick McGrath, Director of Product Management, Commvault. “Taking a more proactive information-driven approach to privacy protection has allowed our customers to improve their GDPR readiness posture, including their ability to clean up their environments to reduce their risk footprint, as well as and accelerate their response to regulatory inquiries and data subject requests. However, with enterprises constantly adopting new applications,  cybercriminals developing new types of cyberattacks and governments implementing new data privacy regulations, organizations need to continually ask themselves “who do they trust with their data.” As a strong advocate for protection of individuals data and data rights, and an advocate for the regulations and responsibilities of organizations to act responsibly, it’s always been Commvault’s position that trust – with data privacy as an element of trust – will be a defining quality of companies that survive in the future of digital business. Despite our progress and the success of our customers, the reality is that many organizations are still struggling to implement the right processes, internal expertise and technology necessary to apply and enforce consistent security and data handling standards across all the different types of data in which personal information resides. They have no way to proactively detect risk hot spots and enforce consistent data handling standards with their employees. This needs to change. As we recognize another Data Privacy Day, we call on responsible IT and business leaders to take action to compel the larger business community and their own organizations to recognize peoples’ inherent right to keep their private data private and join us in advocating for stronger and widely adopted privacy practices. Data Privacy Day shines the light on how data is fast becoming the new currency of our economy, which makes how well we manage and protect it a central consideration. The majority of corporate networks are still not fully equipped to manage this change. Most depend on perimeter based security architectures connected by wires. However, forward thinking CIOs are taking a more uniform approach to securing their data in transit by using a range of new technologies to transform their WANs, including 4G & 5G LTE, cloud-based management and orchestration, software-defined WAN (SD-WAN) and zero trust IoT network architectures. These technologies enable companies to build self-optimizing and self-repairing WANs that can provide the connectivity, agility and availability they need – all while meeting the security standards that are essential for GDPR compliance,” said Todd Kelly, CSO at Cradlepoint.